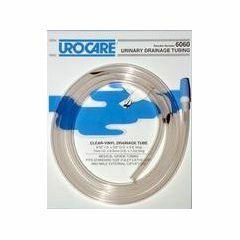 Clear-Vinyl Drainage Tubing - 60"
Urocare Clear-Vinyl Drainage Tubing - 60"
Clear-Vinyl Drainage Tubing is used to connect male external or Foley indwelling catheters to bedside urinary drainage bags, night drain bottles or other urinary appliances. Provides a snug fit on most standard sized connectors, adaptors and fittings while resisting kinks. Simple to use, item exactly as described. It was a little tough to maneuver with it, but after it was trimmed down, it became a little managable. Can the tubing be cleaned and reused if I use water/soap, rinse, and let it dry?